Quorthon of BATHORY has proven time and time again that in spite of his legendary status, his recorded output is spotty and inconsistent at best. 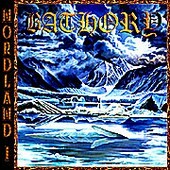 On the latest BATHORY CD "Nordland I" (part one of a two part epic) Quorthon does nothing to change that reputation. This is a dreary and uninspired attempt to re-establish a name in the dark and atmospheric metal scene. A scene that few would argue BATHORY pioneered. The problem here is that a countless number of bands who drew inspiration from BATHORY ended up surpassing their idols. The end result is Quorthon can't even compete in a genre he helped create.